MOVE-IN READY***FRESHLY PAINTED***VERY CLEAN*** Top, 3rd floor level, end unit. 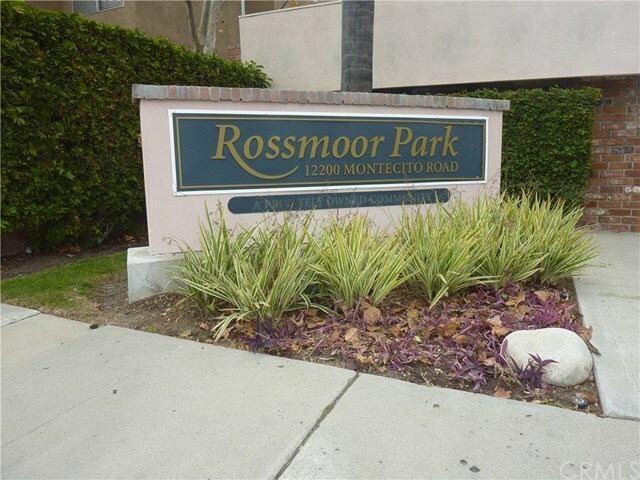 Beautifully updated 2 bedroom 2 bath Rossmoor Park Condo. Spacious living room with balcony. The kitchen has been expanded and features cabinets with maple drawers and pull-out shelves for easy storage, quartz countertop with lots of counter space, designer backsplash, Stainless Steel appliances, new microwave, and a large single-basin stainless steel sink. Throughout the home you'll find plenty of storage, laminate flooring, crown molding, baseboards and scraped ceiling. Updated dual pane windows and sliders. Master bedroom has its own bath with newly installed quartz vanity top, sink, Kohler faucet, mirror, lighting, medicine cabinet, and NuTone brand exhaust fan. Guest bathroom has a deep tub/shower combo, pedestal sink, and Kohler fixtures. The laundry facility is only a few steps away. Walking distance from restaurants, grocery stores and shopping centers such as Sprouts, CPK, Panera Bread, Home Goods, Marshalls, Staples, PetSmart, Kohls, Peets Coffee, and many more. Near beaches and easy access to freeways. Amenities include 2 pools, spa, barbecue area, community laundry, gym, and clubhouse. HOA pays for water and trash. Award-Winning School District.